Defender Dave Buchanan believes the Cobblers squad possesses the characters needed to get out of the relegation mire they find themselves in. But he also admits they have to quickly snap out of their current losing rut, and he sees this Saturday’s Sixfields date with Walsall as an ideal chance to do just that. As one of the more experienced members of the Town squad, Buchanan has seen it and done it over the years when it comes to dragging teams out of bad runs. He admits that losing, just like winning, can become a habit if you allow it to happen, but Buchanan is backing his team-mates to turn the season around. “You just have to keep going,” said Buchanan when asked what the secret is to ending a losing run. “You can’t just give up can you? “I have been in this situation many times, and what I will say is that when you are in the bottom four and in a relegation fight, it hurts. “It is hard to get out of it. “Winning football matches breeds confidence, but when you are losing you just don’t know where that next win is going to come from. “We do have a lot of character in the dressing room and it is up to us, as hard as it is, to keep smiles on our faces and get out on the pitch and perform with confidence. “The fans are not stupid, and if we turn up and we are giving 110 per cent and get beat by a wonder goal or whatever, they can take that. “But I can understand everybody’s frustration when you are turning in performances and getting beat 5-1 at Oldham, and that is no disrespect to them. Yes, the 5-1 loss at Boundary Park last weekend was arguably the low point of a season that has already seen too many disappointments, although the 6-0 home defeat to Bristol Rovers is another contender. The defeat to the Latics saw the Cobblers slip to second bottom in the Sky Bet League One table, and stretched their run of matches without a win to six, with five of those games ending in defeat. So how did the players react to the shock of that loss in Oldham? “Some people are angry, and some people are more vocal than others,” said Buchanan, who captained the team with Marc Richards on the bench. “Some just sit there with their heads down, but the one thing is that this group is full of honest players. 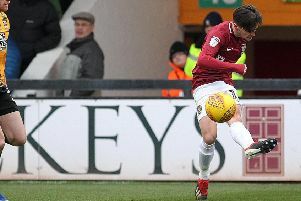 Walsall arrive at Sixfields in good form, and fresh from an excellent 1-0 win over promotion-chasing Scunthorpe United last weekend. The Saddlers have won their past three league games, also seeing off Fleetwood and AFC Wimbledon, and it is a run that has seen them climb from the edge of the relegation zone to a comfortable mid-table position. It’s an example the Cobblers are aiming to follow, and Buchanan sees no reason why Town can’t get the better of Walsall. He is not particularly worried what the visitors will bring to the table, as he feels it is all about the Cobblers. “I think it’s all about our own form, that’s the key,” said the former Preston man. “We should be confident enough to get a result against anybody in this league, especially at Sixfields. “Walsall is the next game, and they are a team we are more than capable of beating if we all turn up. “They have some talented players that can hurt you, but it’s the next game. “If we keep looking backwards at the 5-1 then you’ll have your head down and you’ll get the same result, so you can’t do that. “We have to get out on the training ground, work hard, do what the manager is asking us to do, and then turn up to every game with your head high and your chest out.